Squarespace vs WordPress: which one is better? WordPress for the longest time has dominated its competitors. In fact, it currently has a 60.2% market share of the content management system (CMS) industry. But new site building platforms like Squarespace are slowly creeping in to take over. While Squarespace has a long way to go, there’s no denying that it’s well on its way. Already there’s a lot of buzz surrounding it. And even if you’re not into building websites, you may already know them by name due to their aggressive marketing push. Today we’ll pit these two website builders against each other so you could decide which platform is right for you. Squarespace vs WordPress: What’s the difference? Here’s a quick introduction to Squarespace and WordPress. If you’re hearing about both of these for the first time, here’s all you need to know. 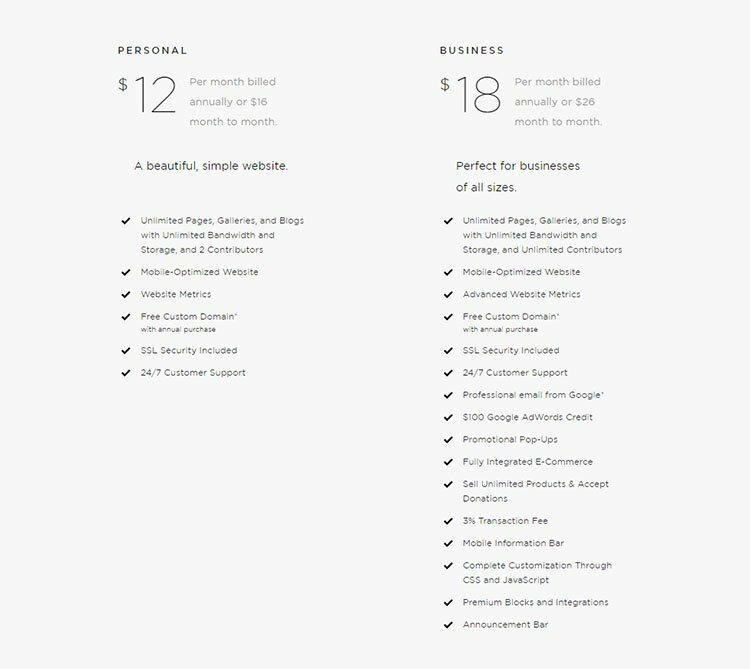 Squarespace is a subscription-based website builder. It’s an all-in-one platform. That means they take care of everything from web hosting to site management. They offer different plans depending on what you plan to use the site for. The Personal plan has limited features but should be sufficient for regular users. Their most expensive plan is the Online Stores – Advanced. It has all the features to convert your site into a powerful e-commerce store. But the site’s main selling point (and the reason why it’s gained popularity) is its drag-and-drop functionality. Users are now able to design their site without the help of professional web designers. This makes the platform ideal for beginners. No need to learn how to code. There are two types of WordPress accounts you could set up. You have WordPress.com and WordPress.org. The .com version caters more for beginners. It has limited functionality and can be used for free. The only downside is that users would essentially have a subdomain (the URL would end in .wordpress.com). It’s more suited for first-time bloggers. The far more superior .org version is the one used by most websites. WordPress.org is a self-hosted CMS. Meaning you would have to find a web hosting provider on your own. While WordPress can be used without coding, you will have to should you need to make aesthetic changes. From this point on, any reference to WordPress would pertain to the .org version. Both of these website builders will do a great job of getting your site off the ground. That said, some features will be better on one platform than the other. Use this as a guide when choosing a platform to use. Squarespace comes out on top in this category. Everything you need to be done can be achieved with a few mouse clicks. Its drag-and-drop functionality makes building websites a breeze. Everything can be resized without messing with the code. Any page you make will be responsive by default. That means anyone who will view your site through their tablet or phone will have a smooth experience. That’s not to say that all these can’t be done on WordPress. Like Squarespace, pages can also be responsive and your site can be customized to your liking. However, it would require CSS knowledge and a powerful theme that’s fully customizable. Both Squarespace and WordPress offer themes (or templates as they’re called on Squarespace). A theme dictates the look of your website. While Squarespace has a ton of theme options, WordPress has thousands in their library. And if you need more powerful themes, there are third-party vendors that offer themes with additional features such as Meridian Themes, ElegantThemes, & ThriveThemes. Squarespace does a respectable job in integrating features that make their sites functional. However, WordPress uses plugins to add features that are unavailable out of the box. In WordPress, it’s easy to add forms and other lead generating features. It’s also easy to integrate them with third-party tools/vendors. Unfortunately, Squarespace features are limited at this time. You can set up forms and integrate it with an email marketing service but it would require some coding. That, however, defeats the whole appeal of using Squarespace to begin with. If your plan is to build an e-commerce site, then Squarespace is the better platform to use. They already have all the tools in place. You can set up your site quickly and have it up and running in no time. While the same can be done on WordPress, you’d have to go through lots of troubleshooting that can leave beginners hanging. There’s a lot you need to figure out. And there’s no number to call should you run into issues (except if you’re using a third-party theme and they have excellent support). Since Squarespace handles everything, you will only need to get in touch with them if you need help. Another thing to consider is SSL certification. Squarespace has it included with your plan. WordPress may require you to get one on your own depending on the situation. Both sites are pretty secure. WordPress security, however, can be upped by installing plugins. You are also free to choose a web hosting provider and are not limited to one like in Squarespace’s case. However, there’s also an upside to having all your security issues taken care off by one company. As far as security goes, we’ll call it a draw. Squarespace pricing is pretty fixed. You have the option to pay on a monthly or annual basis. There’s a significant pricing difference between both options. You pay more to have more features unlocked. With WordPress, the pricing depends on several factors. You’d have to consider the cost of hosting. If you’re considering using a premium theme, they can come as a one-time cost or be paid for monthly/annually. All that considered, if you play your cards right, you may end up saving more through WordPress. You could also see yourself paying for your domain name registration. The Squarespace annual plan comes with one free domain. For WordPress users, some web hosting providers offer one domain name upon signup. If you’ve purchased your domain name from a third-party vendor, you can add them to either site without issue. So overall, it looks like another tie for both website builders. You need to think about SEO if you want to rank in search engines. Squarespace is optimized for search engines right out the gate. WordPress would require you to download some plugins to truly get your site optimized. While it sounds more troublesome to set up your own SEO solution, the tools available on WordPress are actually quite awesome. Take Yoast SEO for example. It has all the features you’d want in an SEO plugin. It’s been proven effective so many rely on it for their SEO needs. So if you want a more customizable SEO solution, you’re better off with WordPress. See this post on WordPress SEO tools and plugins for more information. Like any site owner, you would want to be able to track your analytics. This allows you to see how your site is performing and what changes you need to make. Google Analytics is the go-to option for site analytics. This can be installed in WordPress by adding a line of code to your HTML. While doing so is easy, it’s understandable if site owners feel uncomfortable with touching their code. This is especially true if you have zero knowledge of coding. With Squarespace, they have their own built-in analytics that helps their users track their site traffic. And if needed, you can add your Google Analytics to Squarespace in a few steps. This way, you get the best of both worlds. 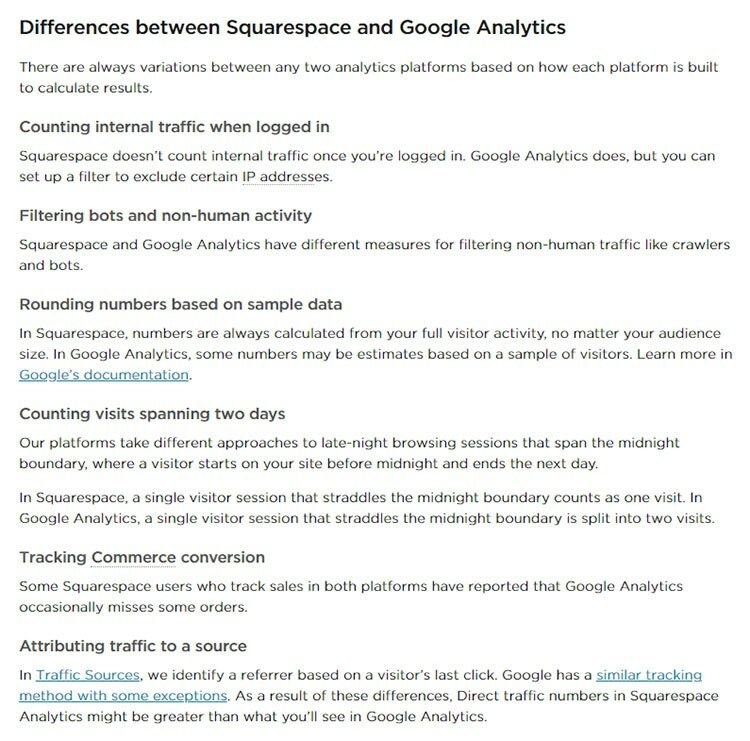 There are a few differences between Squarespace analytics and Google Analytics though as seen below. Squarespace vs WordPress: Which should I choose? As our discussion on Squarespace vs WordPress comes to a close, you might be still be wondering which platform you should use. And as frustrating as this might sound, the right answer would all depend on you. Think about what you need? How far are you going to take your site? Do you only need a site for your portfolio? Do you have no other needs beyond that? Can’t you be bothered to learn how to code? If that’s the case, Squarespace is the no-fuss solution for you. There’s no need to figure out how the backend of your site operates. And you have customer support ready to step in if you are in trouble. But if you want more flexible options and customization. If you want the freedom to choose which plugins are best for your site. If you need more theme options. Then WordPress is the right platform for you. Sure, it can be messier if you don’t know what you’re doing. But lots of people have started on WordPress without all the knowledge they have today. And there’s a lively community of web developers out there that are always publishing resources for beginners. It’s also a great tool to use to learn how to code. If you’re still confused, Squarespace offers a free trial and WordPress.com can be used for free. Give both platforms a try so you can gauge for yourself which one are you more comfortable using.